Mariano Rivera is much more than a world-renowned Yankee player — he’s baseball’s best closer, a thirteen-time All-Star and five-time World Series champion. Rivera played for the New York team for 19 seasons as a relief pitcher and closer, and was famous for his ‘cutter’ pitch. At the end of his baseball career in 2013, Rivera even walked away as a career leader in saves with 652, and games finished clocking in at 952. An impressive man, to say the least. Former New York Yankees Baseball Player; Mariano Rivera was spotted wearing an 18KT White Gold Rolex Skydweller. Reference-326939 ⌚️⚾️ ••••••••••••••••••••••••••••••••••••••••••••••••••••••••••••Price -UK List Price-£35,850 #CelebWatches ••••••••••••••••••••••••••••••••••••••••••••••••• #watch #watches #celebrities #celebrity #fashion #patek #rolex #richardmille #rolexgang #timepiece #instawatch #audemars #richlife #rich #wealth #money #newyorkyankees #newyork #yankees ••••••••••••••••••••••••••••••••••••••••••••••••• Like✔Comment ?Tag Friend? Follow! Thanks to @bmvp13 for the spot? And as one of baseball’s all-time greats, it’s probably no surprise that everyone’s talking about a possible nomination into the hall of fame for 2019. Since Rivera’s legendary career, we’ve seen him step out from under the bright lights and into the philanthropic world — taking on projects in his home country of Panama and even receiving the ROBIE Humanitarian Award. And today, he’s raising his family in New York and casually posing for pictures alongside fellow former-Yankee Alex Rodriguez and artist Jennifer Lopez. 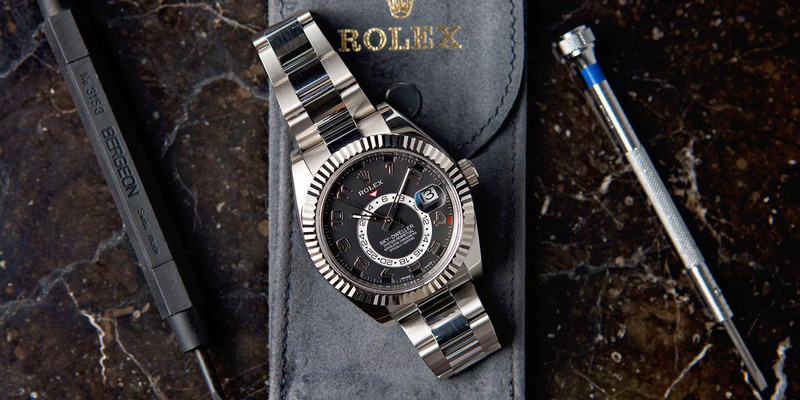 When we came across this photo we had to take a second look because right there, peeking out from under his sleeve, was a stunning 18KT White Gold Rolex Skydweller ref. 326939. It’s an incredible timepiece perfectly fitted for such a legend — so, let’s take a closer look. Mariano Rivera has a Sky-Dweller made of white gold. What’s on Mariano Rivera’s wrist? With a large, modern 42mm case, the Sky-Dweller series feels inherently masculine. 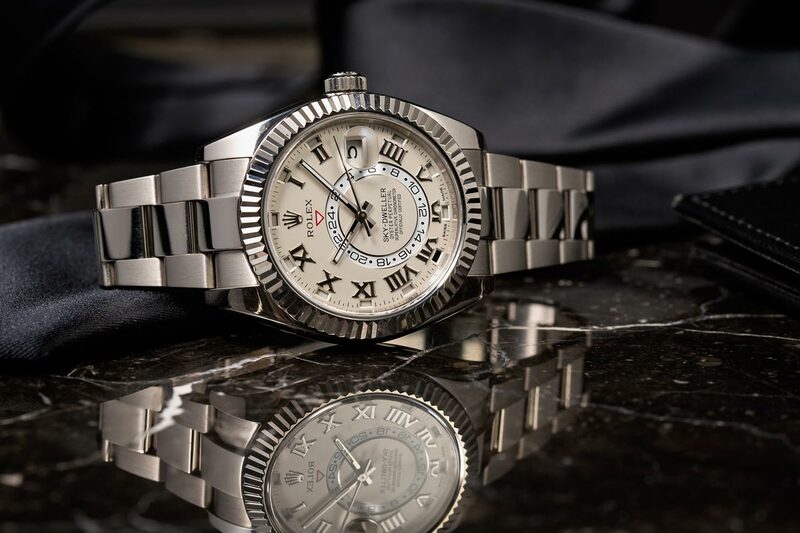 This model here, reference number 326939, quickly became a fan-favorite of Rolex fans for it’s gleaming 18k white gold case and bracelet, and that incredibly refined and distinctive face. Either you love it or you hate it, but the Rolex collectors who love it — they can’t get enough. Here, you can see that Rivera’s watch has a black face outfitted with white Arabic numerals — but that’s not the controversy. It’s the distinctive dial with an open GMT display and an off-center 24-hour dial that sets this watch apart, and makes it a huge departure from the Rolex norm. The Sky-Dweller is also the first of its kind to feature two time zones as well as an innovative annual calendar. While the aesthetics of this watch are — amongst collectors — debated, the look is purposeful and refined overall. At Bob’s, we love this watch. The elegant face right up against white gold really dresses this look up, making it the perfect timepiece to accentuate any black tie event or steal glances at dinner with friends. We wonder if A-Rod had trouble keeping his eyes on his new girlfriend with this gleaming beauty between them. We have a wide array of Sky-Dwellers up on the website for you to browse. Check out a fellow 326939 with a creamy-white face, a stunning yellow-gold ref. number 326938, or the everose model with a leather band. If you love the unique characteristics of a Sky-Dweller, you’re not going to want to miss the deals we have on this incredible timepiece.